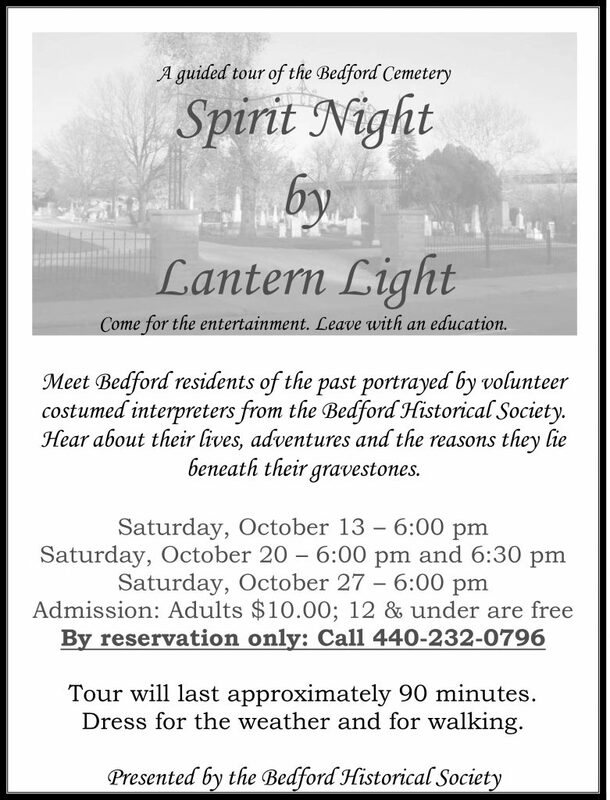 Discover Bedford Township’s animated history through a guided walk by lantern-light through the Bedford Cemetery. Learn about the lives of some of Bedford’s famous and infamous citizenry hauntingly portrayed by their spectral doppelgangers. The fun begins at the Bedford Cemetery on Saturday, October 13, 20, and 27 at 6:00 PM. Tours last approximately 90-minutes. Dress for the weather and for walking.Reservations are required for space is limited. Tickets are $10 per person. 12 and under are free. No refunds on ticket sales. For more information call 440-232-0796.